Some days Ned just can’t keep his head about him. He’s been known to lose his headgear, headphones, and headbands! His Mom isn’t head over heels about that. But that’s nothing compared to the day Ned loses his head! What happens when a young boy loses his head? He must retrieve it in this humorous tale where the word “head” makes its way into the narrative throughout in imaginative ways. Fun and visually appealing. Hats off! After working as a Reading Specialist for the public school system for several years, I began to realize how much awareness of word play and figures of speech have been lost as we enter raise and educate a new generation of children. 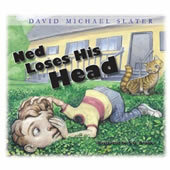 In Ned Loses His Head, David Slater brings word play back into reading in a wonderfully entertaining story. This book is sure to be a great hit not only with elementary kids but with teachers and parents as well. It demonstrates how creative one can be with the English language. The lost art of using a word to make a like-sound game while entertaining youngsters as they read or listen to books is thankfully restored by the gifted writer David Michael Slater. Slater lives and teaches seventh grade Language Arts in Portland, Oregon. He uses his talents to educate and entertain with his humorous books and informative presentations. David writes for children, young adults, and adults. This little story not only is well and wisely written to cover a fun story but he also has taken the time to use the word `head’ in as many variations as possible. Silly? Perhaps, but with the superb illustrations by S.G. Brooks that story takes flight and the multiple levels of understanding the phrases bout losing your head are fine concepts to remember. It is a terrific little story – a fine joint adventure courtesy of David Michael Slater and his colleague in art, S. G. Brooks. Or as the PR states it, `Share subtle life lessons and blatant humor with readers of all ages!